Sometimes mistakenly referred to as caramel sauce, dulce de leche is much finer and more subtle. Although not difficult to make, the key is using superb quality ingredients patience and attention. When achieved successfully, not only do you have a fabulous sauce to mix into ice cream, use with cakes, drizzle onto fruit and popcorn and to put into crepes and empanadas; you also have a wonderful small gift on hand for unexpected occasions and party favors. Once you try making your own dulce de leche, you'll treasure your new-found knowledge. 1. In a cup, stir the water and baking soda together. Set aside. 2. Put the milk in a saucepan. Using a wooden spoon,stir in the sugar while the milk is cold and then bring to a boil. 4. Stirring constantly, pour in the baking soda and water combination in a thin stream. Be careful not to allow any baking soda sitting in the bottom of the cup to be poured in or you will get granules. 5. Return the pot to the stove and continue cooking at a vigorous boil and stirring constantly. 6. Important note: As the sauce thickens, gradually increase the heat to keep the sauce at a boil. 7. Continue cooking for approximately 1 hour, or until the sauce coats the back of a sppon and turns a rich caramel color and is clear. 8. Pour the mixture into a bowel, stir in the vanilla and let cool. 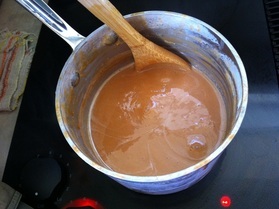 The dulce de leche will keep for 1 to 2 months refrigerated. Add some pretty decoration and these jars of dulce de leche make great hostess gifts.